It's Official! Enzymes Incorporated proudly announces the recognition of the United States Environmental Protection Agency (EPA) as a formulator of safer cleaning products. 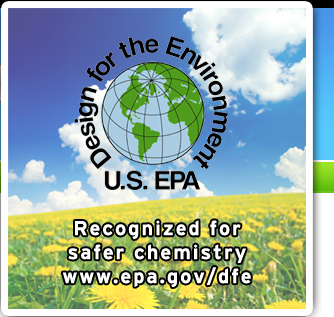 The EPA allows safer products to carry the Design for the Environment (DfE) label. This mark allows consumers to quickly identify and choose products that can help protect the environment and are safer for families. When you see the DfE logo on a product it means that the DfE scientific review team has screened each ingredient for potential human health and environmental effects and based on currently available information, EPA predictive models, and expert judgment the product contains only those ingredients that pose the least concern among chemicals in their class. Product manufacturers who become DfE partners earn the right to display the DfE mark on recognized products. These companies have invested heavily in research, development and reformulation, to ensure that their products line up on the green end of the human health and environmental safety spectrum. You do not have to sacrifice value or performance to do your part for the environment. Go Green with ClearClean Products today! Read more about the EPA's DfE program by visiting www.epa.gov/dfe or click here.